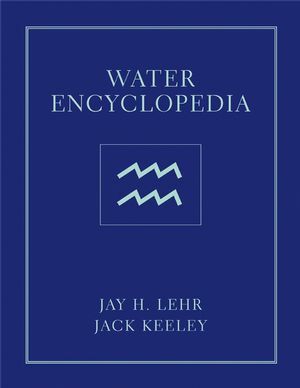 The Water Encyclopedia offers a comprehensive depository of all information relating to the scientific and technological aspects of the world's most important natural resource -- water. The role of water in science, engineering and society requires a one-stop location to find whatever information is available on the cutting edge of the 21st century. This book is a resource for useful public domain data. 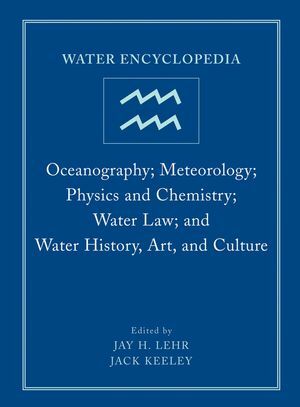 Its focus is expert narrative on all water-related subjects. Jay Lehr is Senior Scientist?at the Heartland Institute and Senior Scientist at Bennett & Williams, Inc. He has written 14 books and over 500 articles on environmental science. He received the nation's first Ph.D. in Ground Water Science form the university of Arizona in 1962. 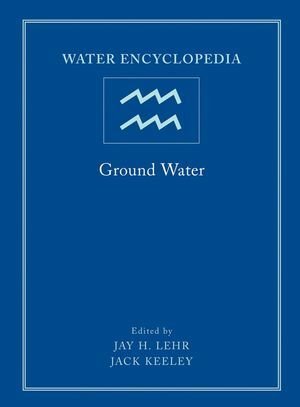 For 25 years he headed the Association of Ground Water Scientists and Engineers. In addition, Dr. Lehr has experience as an academic researcher in environmental science and helped the federal government develop several levels of environmental regulations, including the areas of surface water and ground water. The Arsenic Drinking Water Crisis in Bangladesh. Corrosion Control in Drinking Water Systems. Economics of Residential Water Demands. Gray Water Reuse in Households. Methods of Reducing Radon in Drinking Water. Household Drinking Water Treatment and Safe Storage. Virus Transport in the Subsurface. Mixing and Agitation in Water Treatment Systems. Evaluation of Microbial Components of Biofouling. Threat Agents and Water Biosecurity. Competitive Adsorption of Several Organics and Heavy. Metals on Activated Carbon in Water. A Real-Time Hydrological Information System for Cities. Modeling Chlorine Residuals in Urban Water Distribution Systems. Particulate Matter Removal by Coagulation. Selective Coagulant Recovery from Water Treatment. Plant Residuals Using the Domain Membrane Process. Cross Connection and Backflow Prevention. Molecular-Based Detection of Cryptosporidium Parvum in Water. Measuring Cryptosporidium Parvum Oocyst Inactivation. Following Disinfection With Ultraviolet Light. Diatomaceous Earth Filtration for Drinking Water. Water Quality in Distribution Systems. Design of Water Distribution Systems. The Economics of Water Resources Allocation. Key Causes of Drinking Water Quality Failure in a Rural. Small Water Supply of South Africa. Slow Sand Filtration and the Impact of Schmutzdecke. Multistage Filtration: An Innovative Water Treatment. Particulate Matter Removal by Filtration and Sedimentation. Synthetic and Natural Organic Removal by Biological. Granular Bed and Precoat Filtration. Health Effects of Commonly Occurring Disinfection. Byproducts in Municipal Water Supplies. Health Effects of Microbial Contaminants and Biotoxins in Drinking Water. Drinking Water and Public Health Protection. 1962 U.S. Public Health Service Standards. The State of the Water Industry-2004. Extraterritorial Land Use Control to Protect Water Supplies. Leak Detection and Water Loss Control. Ion Exchange-Use of Magnetic Ion Exchange Resin For Doc Removal. Microbiological Concerns of Drinking Water Distribution Systems. Nitrification of Potable Water Using Trickling Filters. Ozone With Activated Carbon for Drinking Water. Review of Parasite Fate and Transport in Karstic Aquifers. Assessing the Bactericidal Efficiency of Polydex for the Disinfection of Drinking Water in Rural Areas of South Africa. Private Sector Participation, Marketing and Corporate. Strategies in Municipal Water Supply and Sewerage Pumps. Use of Redox Potentials in Wastewater Treatment. Role of Small Water Reservoirs in Environment. Reservoirs, Towers, and Tanks Drinking Water Storage Facilities. Water Treatment Plant Residuals Management. Application of Risk Assessments in Crafting Drinking Water Regulations. PotentialRisks of Waterborne Transmission of Escherichia coli O157:H7. Approaches for Securing a Water Distribution System. Water Security: An Emerging Issue. Guide to Selection of Water Treatment Processes. Hydraulic Design of Water Distribution Storage Tanks. System Control and Data Acquisition (SCADA). Treatment for Technologies for Small Drinking Water Systems. Water Disinfection Using UV Radiation-A Sri Lankan Experience. Drinking Water Quality Standards (DWQS)-United States. Removal of Pathogenic Bacteria, Viruses, and Protozoa. Ten Key Trends That Will Shape the Future of the World Water Industry. Zebra Mussel Control Without Chemicals. 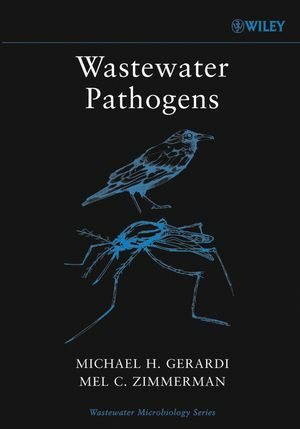 Persistence of Pathogens in Water. Chemical Drinking Water Standards, Past, Present, and Future. Water Impacts from Construction Sites. Economics of Industrial Water Demands. Electric Generating Plants-Effects of Contaminants. Water Use in Energy Production. Evaluation of Toxic Properties of Industrial Effluents by On-Line Respirometry. Use of Anaerobic-Aerobic Treatment Systems for Maize Processing Plants. Bonding of Toxic Metal Ions. Application of Microfiltration to Industrial Wastewaters. Water Treatment in Spent Nuclear Fuel Storage. Industrial Mine Use: Mine Waste. Estimated Use of Water in The United States in 1990. Fine Bubble Diffused Air Aeration Systems. Land Applications of Wastewater in Arid Lands: Theory and Case Studies. Technologies for Arsenic Removal from Contaminated Water Sources. Molecular Biology Tools for Monitoring Biodiversity in Wastewater Treatment Plants. Integrated Capacity Building Needs for Water Supply and Wastewater Sanitation. Chemically Enhanced Primary Treatment of Wastewater. Getting Our Clean Water Act Together. Inadequate Treatment of Wastewater: A Source of Coliform Bacteria in Receiving Surface Water Bodies in Developing Countries-Case Study: Eastern Cape Province of South Africa. Denitrification in The Activated Sludge Process. Waste Treatment in Fish Farms. Flotation as A Separation Process. Degradation of Chloro-Organics and Hydrocarbons. Landfill Leachates, Part I: Origin and Characterization. Landfill Leachates: Part 2: Treatment. Macrophytes as Biomonitors of Polychlorinated Biphenyls. Wastewater Management for Developing Countries. Mercury Removal From Complex Waste Waters. Metal Speciation and Mobility as Influenced by Landfill. Microbial Foaming in the Activated Sludge Process. Introduction to Wastewater Modeling and Treatment. Practical Applications of Wastewater Modeling and Treatment Plant Design. New York City Harbor Survey. Nitrification in the Activated Sludge Process. Effluent Limitations and the NPDES Permit. Odor Abatement in Wastewater Treatment Plants. Aqueous Reactions of Specific Organic Compounds with Ozone. The fate of Persistent Organic Pollutants (POPs) in The wastewater Treatment Process. The Role of Organoclay in Water Cleanup. Biological Phosphorus Removal in the Activated Sludge Process. Photocatalytic Membrane Reactors in Water Purification. EPA's National Pretreatment Program, 1973-2003: Thirty Years of Protecting The Environment. Problems Encountered During Pipe Repair and Renewal. Wastewater Treatment and Recycling Technologies. Wastewater Treatment Processes and Water Reuse. Wastewater Reclamation and Reuse Research. Wastewater Reclamation and Reuse Treatment Technology. Microbial Foaming and Bulking in Activated Sludge Plants. Aqueous Behavior of Elements in a Flue Gas Desulfurization. What Wastewater Utilities Can Do Now to Guard Against Terrorist and Security Threats. Trenchless Repair and Rehabilitation Techniques. Basics of Underground Water and Sewer Pipeline. Water Hammer: Quantitative Causes and Effects. Using Ecosystem Processes in a Constructed Wetland to Treat Mine Wastewater in Ireland. 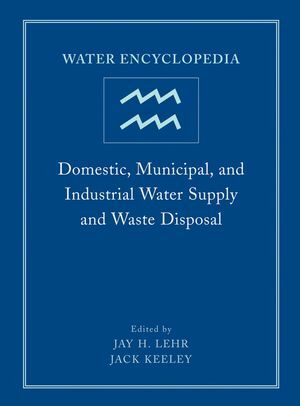 Water and Wastewater Properties and Characteristics. Sewerage Odors-How to Control. Ultrafiltration-Complexation in Wastewater Treatment. Acid Mine Drainage-Extent and Character. The Control of Algal Populations in Eutrophic Water Bodies. Physiological Biomarkers and the Trondheim Biomonitoring System. Biomarkers, Bioindicators, and the Trondheim Biomonitoring System. Active Biomonitoring (ABM) by Translocation of Bivalve Molluscs. Biochemical Oxygen Demand and Other Organic Pollution Measures. Bioluminescent Biosensors for Toxicity Testing. Macrophytes as Biomonitors of Trace Metals. Bromide Influence on Trihalomethane and Haloacetic Acid Formation. Activated Carbon: Ion Exchange and Adsorption Properties. Classification and Environmental Quality Assessment in Aquatic Environments. Coagulation and Flocculation in Practice. Colloids and Dissolved Organics: Role in Membrane and Depth Filtration. Column Experiments in Saturated Porous Media Studying Contaminant Transport. Cytochrome P450 Monooxygenase as an Indicator of PCB/Dioxin-Like Compounds in Fish. Disinfection By-Product Precursor Removal from Natural Waters. Alternative Disinfection Practices and Future Directions for Disinfection By-Product Minimization. Water Quality Aspects of Dredged Sediment Management. The Economics of Water Quality. Understanding Escherichia Coli O157:H7 and the Need for Rapid Detection in Water. Trace Element Contamination in Groundwater of District Hardwar, Uttaranchal, India. Cartridge Filters for Iron Removal. Irrigation Water Quality in Areas Adjoining River Yamuna At Delhi, India. Water Sampling and Laboratory Safety. Municipal Solid Waste Landfills-Water Quality Issues. Land Use Effects on Water Quality. Monitoring Lipophilic Contaminants in the Aquatic Environment using the SPMD-TOX Paradigm. Use of Luminescent Bacteria and the Lux Genes For Determination of Water Quality. Water Quality Management and Nonpoint Source Control. Water Quality Management in an Urban Landscape. Water Quality Management in the U.S.: History of Water Regulation. Water Quality Management in a Forested Landscape. Metal Ion Humic Colloid Interaction. Heavy Metal Uptake Rates Among Sediment Dwelling Organisms. Microbial Enzyme Assays for Detecting Heavy Metal Toxicity. Microbial Forms in Biofouling Events. Microbiological Quality Control in Distribution Systems. Water Quality Models for Developing Soil Management Practices. Field Sampling and Monitoring of Contaminants. Water Quality Models: Chemical Principles. Water Quality Models: Mathematical Framework. Environmental Applications with Submitochondrial Particles. Interest in the Use of an Electronic Nose for Field Monitoring of Odors in the Environment. A Primer on Water Quality. Overview of Analytical Methods of Water Analyses With Specific Reference to EPA Methods for Priority Pollutant Analysis. Emerging and Recalcitrant Compounds in Groundwater. Review of River Water Quality Modeling Software Tools. Salmonella: Monitoring and Detection in Drinking Water. Regulatory and Security Requirements for Potable Water. A Weight of Evidence Approach to Characterize Sediment Quality Using Laboratory and Field Assays: An Example For Spanish Coasts. Remediation and Bioremediation of Selenium-Contaminated Waters. Quality of Water in Storage. The Submitochondrial Particle Assay as a Biological Monitoring Tool. Microscale Test Relationships to Responses to Toxicants in Natural Systems. Development and Application of Sediment Toxicity Tests for Regulatory Purposes. Ground Water Quality in Areas Adjoining River Yamuna at Delhi, India. Dose-Response of Mussels to Chlorine. Metallothioneins as Indicators of Trace Metal Pollution. Ciliated Protists as Test Organisms in Toxicity Assessment. SOFIE: An Optimized Approach for Exposure Tests and Sediment Assays. Passive Treatment of Acid Mine Drainage (Wetlands). Biomarkers and Bioaccumulation: Two Lines of Evidence to Assess Sediment Quality. Lead and its Health Effects. Microbial Detection of Various Pollutants as an Early System for Monitoring of Water Quality and Ecological Integrity of Natural Resources, in Russia. Luminescent Bacterial Biosensors for the Rapid Detection of Toxicants. Development and Application of Sediment. Toxicity Test for Regulatory Purposes. 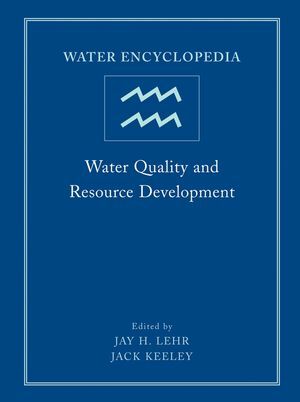 Water Resource Development and Management. Water Resources Challenges in the Arab World. Effluent Water Regulations in Arid Lands. California-Continually the Nation's Leader in Water Use. Lessons from the Rising Caspian. Institutional Aspects of Water Management in China. Will Water Scarcity Limit China's Agricultural Potential? Water Use Conservation and Efficiency. The Development of American Water Resources: Planners, Politicians, and Constitutional Interpretation. Water Markets: Transaction Costs and Institutional Options. Water Supply and Water Resources: Distribution System Research. Drought in the Dust Bowl Years. Drought and Water Supply Management. Assessment of Ecological Effects in Water-Limited Environments. Reaching Out: Public Education and Community Involvement in Groundwater Protection. Integration of Environmental Impacts into Water Resources Planning. The Expansion of Federal Water Projects. Flood Control History in the Netherlands. Remote Sensing and GIS Application in Water Resources. 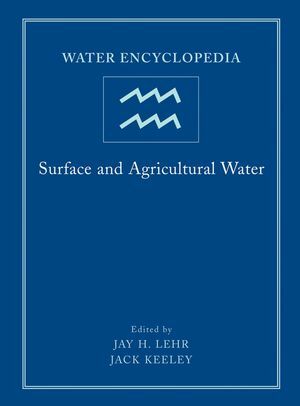 Water Science Glossary of Terms. Urban Water Resource and Management in Asia: Ho Chi Minh City. Water Markets in India: Economic and Institutional Aspects. Overview and Trends in the International Water Market. Best Management Practices for Water Resources. Integrated Water Resources Management (IWRM). Management of Water Resources for Drought Conditions. NASA Helping to Understand Water Flow in the West. Transboundary Water Conflicts in the Nile Basin. Planning and Managing Water Infrastructure. Application of the Precautionary Principle to Water Science. Spot Prices, Option Prices, and Water Markets. Water Managed in the Public Trust. Water Recycling and Reuse: The Environmental Benefits. State and Regional Water Supply. River Basin Decisions Support Systems. Water Resource Sustainability: Concepts and Practices. The Provision of Drinking Water and Sanitation in Developing Countries. Sustainable Management of Natural Resources. Sustainable Water Management On Mediterranean Islands: Research and Education. Meeting Water Needs in Developing Countries with Tradable Rights. Water Use in the United States. How We Use Water in These United States. Water-Here, There, and Everywhere in Canada. Water Conservation-Every Drop Counts in Canada. Ecoregions: A Spatial Framework for Environmental Management. Flood of Portals on Water. Fuzzy Criteria for Water Resources Systems Performance Evaluation. Geochemistry of Acid Mine Drainage. The Aral Sea Disaster: Environment Issues and Nationalist Tensions. Lake Baikal-A Touchstone for Global Change and Rift Studies. River Basin Planning and Coordination. Biotic Integrity Index to Evaluate Water Resource Integrity in Freshwater Systems. Reversal of the Chicago River. Flood Control in the Yellow River Basin in China. Chrionomids in Sediment Toxicity Testing. Time-Area and The Clark Rainfall-Runoff Transformation. Dilution-Mixing Zones and Design Flows. Fish Cells in the Toxicological Evaluation of Environmental Contaminants. Fisheries: History, Science, and Management. Factors Affecting Fish Growth and Production. Water Needs for Freshwater Fisheries Management. An Outline of the History of Fishpond Culture in Silesia, the Western Part of Poland. Floods as a Natural Hazard. Flood Source Mapping in Watersheds. Greenhouse Gas Emissions From Hydroelectric Reservoirs. Potential Health Issues Associated With Blue-Green Algae Blooms in Impoundments, Ponds and Lakes. Heat Balance of Open Waterbodies. Hydroelectric Reservoirs as Anthropogenic Sources of Greenhouse Gases. Hydrologic Persistence and The Hurst Phenomenon. Hydrological Processes and Measured Pollutant Loads. Kinematic Wave Method For Storm Drainage Design. Kinematic Wave and Diffusion Wave Theories. Reliability Concepts in Reservoir Design. The Theory of Alternative Stable States in Shallow Lake Ecosystems. NOAA Lake Level Forecast for Lake Michigan Right on Target. Submerged Aquatic Plants Affect Water Quality in Lakes. Lasers Scan Levees from the Air. Adsorption of Metal Ions On Bed Sediments. Microbiology of Lotic Aggregates and Biofilms. Microorganisms in Their Natural Environment. Calibration of Hydraulic Network Models. Uncertainty Analysis in Watershed Modeling. Modeling of Water Quality in Sewers. Modeling of Urban Drainage and Stormwater. Corps Turned Niagara Falls Off, On Again. Organic Compounds and Trace Elements in Freshwater Streambed Sediment and Fish from the Puget Sound Basin. Pond Aquaculture-Modeling and Decision Support Systems. Dam Removal as River Restoration. Water from Saturated River Sediment-Sand Abstraction. Urban Stormwater Runoff Water Quality Issues. Rivers and Streams: One-Way Flow System. Water Quality in Surburban Watersheds. Surface Runoff and Subsurface Drainage. Trace Elements in Water, Sediment, and Aquatic Biota-Effects of Biology and Human Activity. Innovative Pens Hatch Thousands of Trout. Time of Concentration and Travel Time in Watersheds. Watershed Management for Environmental Quality and Food Security. Water Hyacinth-The World's Most Problematic Weed. Wetlands: Uses, Functions, and Values. Classification of Wetlands and Deepwater Habitats of the United States. Effects of DDT in Surface Water on Bird Abundance and Reproduction-A History. Animal Farming Operations: Groundwater Quality Issues. Biofuel Alternatives to Fossil Fuels. Agricultural Water Use Efficiency (WUE) and Productivity (WP). Large Area Surface Energy Balance Estimation Using Satellite Imagery. Soil Erosion and Control Practices. Water Table Contribution to Crop Evapotranspiration. Water Pollution From Fish Farms. Irrigation in The United States. Agriculture and Land Use Planning. Water Quality Management in an Agricultural Landscape. Classification and Mapping of Agricultural Land for National Water-Quality Assessment. Metal Tolerance in Plants: The Roles of Thiol-Containing Peptides. Microirrigation: An Approach to Efficient Irrigation. Plant and Microorganism Selection for Phytoremediation of Hydrocarbons and Metals. Occurrence of Organochlorine Pesticides in Vegetables Grown on Untreated Soils from an Agricultural Watershed. Pesticide Chemistry in the Environment. Remediation of Pesticide-Contaminated Soil at Agrichemical Facilities. Pesticide Occurrence and Distribution in Relation to Use. Assessment of Pollution Outflow From Large Agricultural Areas. Microbial Quality of Reclaimed Irrigation: International Perspective. Maintaining Salt Balance on Irrigated Land. Groundwater Assessment Using Soil Sampling Techniques. Soil N Management Impact on The Quality of Surface and Subsurface Water. Soil Phosphorus Availability and Its Impact on Surface Water Quality. Crop Water Stress Detection Using Remote Sensing. Tile Drainage: Impacts, Plant Growth, and Water Table Levels. Measuring and Modeling Tree and Stand Level Transpiration. Water Logging: Topographic and Agricultural Impacts.